Xiaomi has announced a promotional sale on Amazon India which will go live on December 6 for two days and will end on December 8. 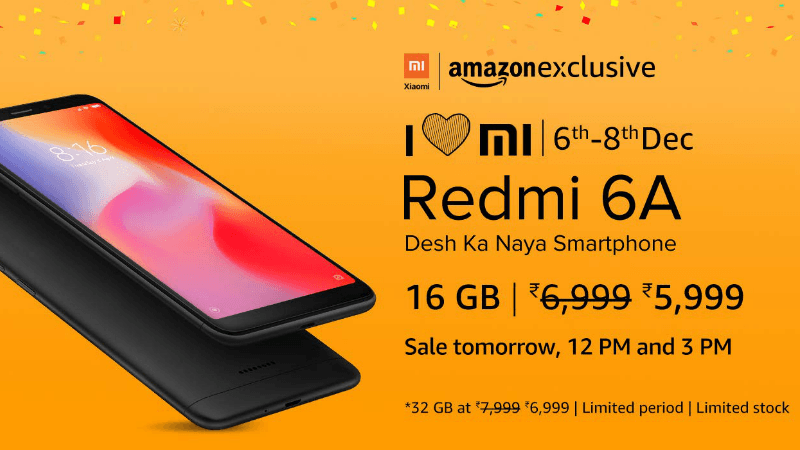 As part of this promotional sale, Xiaomi phones retailing on the Amazon India website will be available with attractive offers, discounts, cashbacks and more. Also, Xiaomi has currently revealed two offers from its side while classifying the third offer as a “special surprise”. This sale will be called the “I Love Mi” Sale on Amazon and as part of this, the Xiaomi Mi A2 will be available with discounts up to Rs 3,500 whereas the Redmi Y2 will come with a discount of Rs 2,000. The two prominent titles which will be part of the discount in this sale will include the Xiaomi Mi A2 and the Redmi Y2. Out of these two phones, the Redmi Y2 3GB RAM and 32GB storage variant will be up for sale with a discounted price tag of Rs 8,999 down from its MRP of Rs10,499, while the other Redmi Y2 variant with 4GB RAM and 64GB storage will retail for only Rs 10,999, with its original MRP being Rs 13,499. The Xiaomi Mi A2 will be another steal deal in this sale, as it will also be under discount between December 6 to December 8 on Amazon India. The entry-level 4GB RAM and the 64GB variant of the Mi A2 will be up for sale at Rs 14,999 with its original MRP being Rs 17,499, whereas the 6GB RAM and 128GB variant will bear a discounted price tag of Rs 16,999, down from its original MRP of Rs 20,500. In addition to the Redmi Y2 and the Xiaomi Mi A2, the Redmi 6A will also be another phone with a discounted price tag. The Redmi 6A with 2GB RAM and 16GB storage will retail for Rs 5,999 while the second variant of Redmi 6A with 2GB RAM and 32GB internal storage will be available for Rs 6,999. Not only this, but Xiaomi is also yet to announce another deal which will be the part of ‘I love Mi’ sale on Amazon on Thursday. We expect that this announcement could very well be the discount on the Redmi 6A. Also, as part of this sale, Amazon will ship bundled discounts for users like no-cost EMI and exchange discounts for the buyers of Mi A2 and Redmi Y2. It’s worth noting that Amazon’s ‘I love Mi’ sale coincides with the Flipkart Big Shopping Days sale which will also go live on the same day, December 6. The highlight of this sale by Flipkart is going to be the Snapdragon 845 powered Poco F1, which will be available with a discount of up to Rs 5,000 during Flipkart’s sale. Apart from Flipkart, this offer will also be available on the Mi online official store as well apart from Amazon and Flipkart. Under this sale, the Poco F1 base variant will be available for Rs 19,999.
redmi 6a back to original price. is great deal. Especially in rural area’s where JIO penetration is widely available.